32-year-old Tulsi Javeri from Goregaon, Mumbai was born blind with Retinitis Pigmentosa (RP). Her well-to-do parents took good care of her and made sure she went to school and didn’t miss out on formal education. She was put in a nearby Marathi medium pre-primary blind school where she completed her kindergarten. After completion of her kindergarten, her parents tried to find her a mainstream school. Multiple schools rejected her admission to the disappointment of her parents’ aspirations for Tulsi. But luckily for them she was finally admitted in a mainstream school where she started her education and went on to pursue higher education. 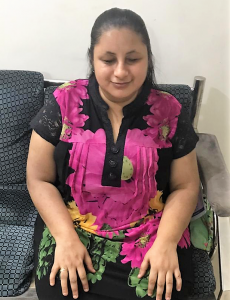 Since getting to know about Eyeway in 2017, Tulsi has gradually become a friend of Eyeway, communicating almost every day with the counselor. It was during these consistent conversations with the counselor, she started to share her feelings on the social exclusion she was facing. She said she is suffering from loneliness due to this lack of acceptance and thus having to spend most of her time alone. She wanted to get connected with people and have a vibrant social life, but she didn’t know how. Her visual impairment has come in the way for her to lead a normal social life. Also the lack of accessible technology around her like the internet, android phone, social media etc. did adversely impact. Although she had support from teachers, friends and family, it remained task-specific. Like, if she needed class notes, study material, help with writing exams etc. she got immense support and it ended there. Such support helped in pursuing her college education, enhancing her music skills or acquiring a new training. It was not helping her to find friends, occasions or events to spend a life outside her household. At the same time she also completed her Visharad in Hindustani Classical music and post-graduation in music. After completing her college, she also learned computer from a private training center which she had to redo after few years due to the lack of practice. Eyeway counselor on understanding her issues and finding how ambitious she is about her personal and professional life wanted to help her with the best solutions. The counselor shared with her multiple ways to get connected with people both on the social media and in real life. She shared with her information on various gatherings where visually impaired people meet, interact and socialize. On the accessibility and technology related issues she was given adequate information, specifically on how to create multiple email accounts, how to use social media, perform software updates etc. Also, the counselor connected her with a reliable source to help her out in using her phone. Tulsi expressed her joy in knowing so much on the opportunities she has to broaden the horizons of her life. She remains to be a frequent caller and Eyeway hopes to help her in every way possible.